The Roche’s ties to the Hudson Valley have always kept Meaghan, now a senior communication student on track for a Spring graduation, relatively aware of Marist. “I’ve been familiar with the area my whole life… it holds a special place in my heart. I know what you’re thinking,” she says. “Really? Poughkeepsie? Yeah, I love it here.” It has been clear for some time that Meaghan belonged at Marist, specifically in the school’s Center for Sports Communication. Her love for the school came long before her enrollment. After holding out hope on what was not an uncommon sentiment for a younger sibling, she got her wish. Even before arriving, Meaghan knew that this was her school. This was, as a matter of fact, her home. The opportunities were endless, as the old cliché goes, and Meaghan witnessed that firsthand, even before arriving. When Center Field first began publishing, Meaghan was immediately named Executive Editor. Whilst, at that time, not having a relationship aside from “fellow classmate” with co-founders Matt Rzodkiewicz and Marco Schaden, they quickly became some of her closest friends. As time went on, Meaghan continued to climb the ranks. She has since served as Deputy Editor-in-Chief, and will be the site’s EIC starting in January of 2019. It didn’t start out that way. “I get an email from the department about Center Field, and I go to the first meeting and sign up for what I’m interested in, but I asked the kids who seemed to be in charge if they needed someone to be an editor. They didn’t really seem to have a solid answer for me,” she says, just citing a classic Marco moment. She wasn’t entirely sure, especially at the beginning, that this publication would go anywhere, nor that she’d be so heavily involved. That second family has gotten Meaghan opportunities to work with Baseball Miracles and McMillan Publishing, just two of the high profile opportunities she hopes to garner experience from in her employment search. She’s a weird journalist, one that refuses to drink coffee (see her Twitter bio). But she’s a journalist nonetheless; one with the passion and authentic drive to find success wherever she may go. As you pull out of Marist College, you can turn two ways. Turning right will take you in the direction of the Poughkeepsie Galleria Mall, a shopping center that houses one of the country’s 558 Regal Cinemas. The theater is a dime a dozen, with uniformed staff members and police officers guarding the back entrance in case of any high-schooler induced chaos. It offers a copious number of showtimes for films like “What Men Want,” “Aquaman,” “Escape Room,” and more. 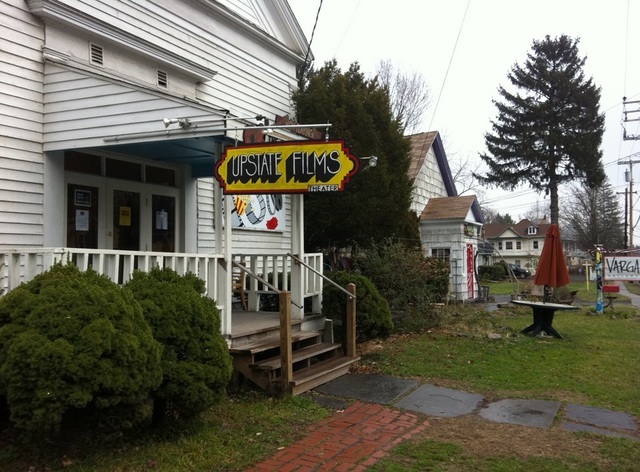 Turning left will greet you with a scenic and winding 25-minute drive to Rhinebeck and its crowned jewel, Upstate Films. Showtimes begin around 3:00 p.m., on most days, at least. It is so delightfully modest and valued that its size of facility and staff is misleading. The town is one that shuts down around 6 p.m. It’s pristine and pleasing; that’s the way everyone likes it. It also wouldn’t be what it is without this particularly charming entity. Founded in 1972 by Steve and DeDe Lieber, Upstate Films has been a staple in the culture of Rhinebeck for 47 years. Since the beginnings of the humble, non-profit arthouse theater, the Liebers has expanded to two theaters, another housed in an old church in Woodstock. Their screens have doubled from one to two in Rhinebeck, giving them the opportunity to showcase more of the art that inspired them to start this project in the first place. In 1972, Rhinebeck was nowhere near what it is today. Now, its main stretch of road is filled with shops that are pictured next to the dictionary definition of the word “kitsch.” It’s the type of town that TV-producers love to film in and people love to say they’ve been. It wasn’t always. Once, there was a tavern and a few shops that would be accessed on occasion by those close by. The decision has worked. Beyond the aesthetic appreciation of their community, the film community as a greater population has congregated from bordering towns. It’s a humble home for these moviegoers, one that acts as more of an experience than anything else. Membership nears 3,000, because of the people’s desire to, according to Griffith, “see good movies” and the Lieber’s desire to show good movies.